I’m very happy to say that I’ve got a story in this fabulous reprint anthology edited by Paula Guran. 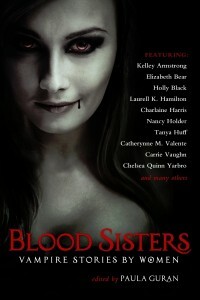 Blood Sisters: Vampire Stories by Women can be pre-ordered here. This entry was posted in fairy tales, News, On Writing: General and tagged Blood Sisters: Vampire Stories by Women, Caitlin R. Kiernan, Catherynne M Valente, charlaine harris, Chelsea Quinn Yarbro, Elizabeth Bear, Laurell K Hamilton, Lisa L Hannett, Lucy Snyder, Melanie Tem, Nalo Hopkinson, Pat Cadigan, Paula Guran, Storm Constantine, Tanith Lee. Bookmark the permalink.